My choice to quit the band and play basketball my last year of high school was a shock to the music teacher. I tried out for basketball more for my Dad than my skills on the court because he had attended and played all around sports at the same schools, and of his 5 sons I was the first to play sports. 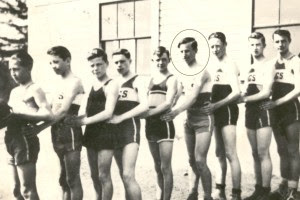 The photograph shown is the Derby Maine Grammar School basketball team around 1931. The person circled is my Dad, who was best known later in high school as a running back, and proudly recalled the time he was knocked out 3 times in one football game. I promised readers some time back to provide details of my stunning basketball career highlight. My basketball peers were more experienced having played all through school, so I settled for a spot on the Junior Varsity team. The JV team was the warmup game before the seasoned varsity team took center stage. You may have noticed the title here includes “highlight”, and not plural. Not only was I on the junior team, I was 3rd string, or maybe it was 4th. If our team was behind 20-30 points with a minute to go, maybe, and just maybe, some of us misfits would get some play time. We didn’t care. We had front row seats and free tickets to every varsity game, plus fresh oranges at half time. Life was good. The sheer excitement getting on court was too much for some. One of the misfits would run past everyone and leap up behind the backboard to grab a pipe, and swing from the supports while waving to the crowd. Our playing skills were classic 3 Stooges! Highlight: In one game and stopped 25 feet away with my back to our basket, and double teamed, I chose to leap straight up, spin 180 degrees, and throw in the direction of the basket. It went in! I looked to the bench just in time to see the coach shaking his head with his face buried in his hands. Haha! I was fouled to boot and missed both foul shots. That was the highlight of my basketball career. One season. Two points. Lotsa laughs.